President Andrew Johnson issued an amnesty proclamation to "induce all persons to return to their loyalty" to the United States of America. This was the third of such proclamations, but the first to offer amnesty at the conclusion of the war. Johnson offered an oath to all participants in the "rebellion." After swearing this oath all rights of property would be restored on the individual except that of owning slaves. Exempted from the benefits of the oath were fourteen "classes" of individuals who engaged in the war against the Union from civil or diplomatic officers of the Confederacy to individuals who conducted piracy against Union commerce during the war. However, individuals in the "excepted classes" were allowed to apply for pardon from the President. 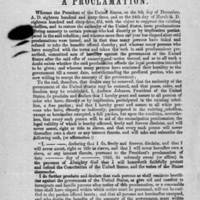 UNC School of Education, "Johnson's Amnesty Proclamation," Learn NC: North Carolina Digital History, http://www.learnnc.org/lp/editions/nchist-civilwar/4807 (accessed January 18, 2012). The following classes of persons are excepted from the benefits of this proclamation: 1st, all who are or shall have been pretended civil or diplomatic officers or otherwise domestic or foreign agents of the pretended Confederate government; 2nd, all who left judicial stations under the United States to aid the rebellion; 3d, all who shall have been military or naval officers of said pretended Confederate government above the rank of colonel in the army or lieutenant in the navy; 4th, all who left seats in the Congress of the United States to aid the rebellion; 5th, all who resigned or tendered resignations of their commissions in the army or navy of the United States to evade duty in resisting the rebellion; 6th, all who have engaged in any way in treating otherwise than lawfully as prisoners of war persons found in the United States service, as officers, soldiers, seamen, or in other capacities; 7th, all persons who have been, or are absentees from the United States for the purpose of aiding the rebellion; 8th, all military and naval officers in the rebel service, who were educated by the government in the Military Academy at West Point or the United States Naval Academy; 9th, all persons who held the pretended offices of governors of States in insurrection against the United States; 10th, all persons who left their homes within the jurisdiction and protection of the United States, and passed beyond the Federal military lines into the pretended Confederate States for the purpose of aiding the rebellion; 11th, all persons who have been engaged in the destruction of the commerce of the United States upon the high seas, and all persons who have made raids into the United States from Canada, or been engaged in destroying the commerce of the United States upon the lakes and rivers that separate the British Provinces from the United States; 12th, all persons who, at the time when they seek to obtain the benefits hereof by taking the oath herein prescribed, are in military, naval, or civil confinement, or custody, or under bonds of the civil, military, or naval authorities, or agents of the United States as prisoners of war, or persons detained for offenses of any kind, either before or after conviction; 13th, all persons who have voluntarily participated in said rebellion, and the estimated value of whose taxable property is over twenty thousand dollars; 14th, all persons who have taken the oath of amnesty as prescribed in the President’s proclamation of December 8th, A.D. 1863, or an oath of allegiance to the government of the United States since the date of said proclamation, and who have not thenceforward kept and maintained the same inviolate. Andrew Johnson, "Proclamation of Amnesty and Reconstruction," May 29, 1865, Civil War Era NC, accessed April 24, 2019, https://cwnc.omeka.chass.ncsu.edu/items/show/13.